Lupus Nephritis: Is the Kidney Biopsy Currently Necessary in the Management of Lupus Nephritis? Most patients with SLE develop kidney disease related to this systemic underlying disease process. Lupus nephritis is an important cause of morbidity and even mortality in patients with systemic lupus erythematosus. Lupus nephritis has diverse morphologic manifestations with varying clinical presentations and consequences. The pathogeneses involve immune complexes, which can deposit anywhere in the kidney, and other mechanisms, including endothelial injury, podocytopathy, and tubulointerstitial injury. Treatment and prognosis accordingly range from excellent even with only observation with minimal mesangial deposits, to kidney failure despite aggressive immunosuppression in patients with severe proliferative disease. Renal biopsy plays a crucial role in the diagnosis of the specific form of lupus nephritis in any patient. However, the role of the renal biopsy in prediction of outcome, treatment, and prognosis has been controversial. We will review the current classification of lupus nephritis and the value of renal biopsy in the management of these patients. Although overall mortality has decreased remarkably in patients with SLE over the last decades, renal disease remains the leading cause of death in these patients (1). Renal disease develops in more than half of SLE patients, and represents the first clinical manifestation of SLE in 15%–20% (2,3). The role of the renal biopsy in diagnosis, treatment, management, and follow-up of lupus nephritis (LN) is critical. Routine performance of a renal biopsy has been advocated by some nephrologists in SLE patients with any signs of kidney disease (4,5). However, the role of the renal biopsy in prediction of outcome and prognosis has been a matter of controversy. This review will focus on the current classification of LN and will assess the value of renal biopsy in the management of patients with LN. The original World Health Organization (WHO) classification of LN introduced in 1974 has more recently evolved into the 2003 International Society of Nephrology (ISN)/Renal Pathology Society (RPS) classification (Table 1) (6). The changes introduced in the new ISN/RPS classification have been extensively reviewed (7,8) and will be only briefly mentioned here. The “normal” category of LN was eliminated from the previous WHO classifications, and mesangial LN was thus divided into two categories to maintain the relevant number designation of other classes. Class I LN, minimal mesangial LN, has normal glomeruli by light microscopy and mesangial immune complex deposits by immunofluorescence microscopy. Class II mesangial LN describes biopsies with mesangial deposits and evident mesangial proliferation by light microscopy. Classes III (focal) and IV (diffuse) are defined by glomerular scars and/or proliferative, necrotizing, and crescentic lesions, involving <50% (III) or >50% (IV) of glomeruli. These lesions are specified as active (A), chronic (C), or both (A/C). In addition, class IV is subdivided in two subcategories, class IV-S (segmental) and class IV-G (global), to more specifically quantify the segmental (<50% of the glomerular tuft) versus global (≥50% of the glomerular tuft) distribution of the glomerular lesions, which have been proposed by some authors to have different outcomes (9). Furthermore, the subcategories of the old WHO class V with additional proliferative lesions were also eliminated, and instead such complex lesions should be diagnosed as both class III and class V, or class IV and class V.
This new ISN/RPS classification thus has more detailed definitions of specific categories, and this has resulted in improved reproducibility in preliminary studies. Renal biopsies with LN were evaluated initially using the WHO classification, and 1 year later by the ISN/RPS classification, with significant improvement in interobserver reproducibility. However, the reproducibility of assessment of activity and chronicity was suboptimal (10). Additional studies have so far confirmed higher consensus with the ISN/RPS classification (11,12). Challenges remain in interpretation of some histologic findings in LN. Chronic lesions, such as segmental or global sclerosis, that are interpreted as sequelae of previous more aggressive lesions are, in the current classification, an indicator of either class III or class IV. Therefore, it is implied that careful evaluation and integration of pathologic findings will allow for a distinction of global or segmental sclerosis due to nonspecific findings, such as obsolescence secondary to aging, ischemia, or hypertension, versus chronic lesions resulting from previous crescents, fibrinoid necrosis, or endocapillary proliferation. Thus, a segmentally sclerosing lesion producing a broad-based adhesion to Bowman's capsule most likely represents organization of a crescent and/or necrosis and/or endocapillary proliferation, and therefore, will be interpreted as a chronic lesion of class III or IV LN (Figure 1). The interpretation of globally sclerosed glomeruli can be particularly challenging. Globally sclerosed glomeruli can have obsolescent or solidified phenotypes. Obsolescent glomeruli show retraction of the tuft with collagenous material in Bowman’s space and increase with aging. This appearance overlaps with an end stage sclerosed glomerulus with a fibrous crescent. Excess cells in the collagenous area or evidence of proliferative injury in the tuft can help distinguish sclerosis due to LN from other causes of sclerosis (Figure 2). The global solidification of glomerular tufts occurs particularly in so-called decompensated benign nephrosclerosis in African Americans (13). The interpretation of segmentally sclerosing lesion in membranous LN class V can be particularly challenging. Segmental sclerosis is common in chronic idiopathic membranous glomerulopathy (Figure 3) (14), and thus, it may be difficult to distinguish this nonspecific sclerosis from chronic class III or IV lesions. Furthermore, a membranous pattern with segmental sclerosis may be a manifestation of class V LN with superimposed class III or class IV(S) lesions that are now chronic, a possibility that is not captured in the ISN/RPS classification. The presence of Bowman’s capsule tethering, retraction, and lamellation with adhesion to the tuft may support that a segmental sclerosis lesion is secondary to additional chronic class III or IV lesions, rather than just class V membranous LN with usual sclerosis. Lupus nephropathy with mesangial proliferation, segmental endocapillary proliferation, and secondary sclerosis. The segmental area of sclerosis shows adhesion and thickening of Bowman’s capsule, with a “tethered” appearance, characteristic of scarring of a proliferative lesion. Global sclerosis in lupus nephritis. Despite the extensive degree of sclerosis, the glomeruli show residual cellularity, suggesting the presence of previous endocapillary proliferation. One glomerulus shows parietal epithelial cell activation, suggesting a possible crescent or active sclerosing lesion. Membranous lupus nephropathy with segmental sclerosis. 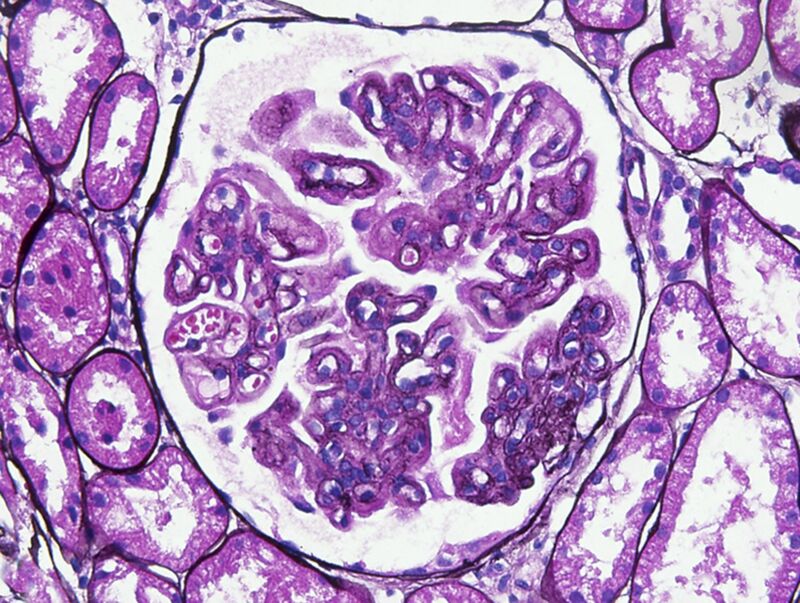 The area of segmental sclerosis seen in this glomerulus resembles the type of segmental sclerosis that would be seen superimposed on idiopathic membranous nephropathy. There is no evidence of active lupus lesions. Does the ISN/RPS Classification Help Prognosticate Outcome? The prognostic value of renal biopsy in LN and in general has been a matter of debate. Early studies underscored the lack of usefulness of the WHO classification in predicting prognosis and renal function beyond that predicted clinically (15,16). However, in one series, various clinical prognostic markers and biopsy chronicity indices were both helpful in predicting long-term outcomes, renal insufficiency, renal failure, and death. Markers of disease severity reflecting organ damage due to SLE and other comorbid conditions were combined with markers of immunologic activity (low serum complement and elevated DNA binding) to predict renal and patient survival. In this study, light and electron microscopy data provided only limited value to add predictive information to the clinical models (17). In patients with diffuse proliferative LN, only increased creatinine and extent of extraglomerular deposits were significant prognostic factors for decreased renal survival (18). In another study of patients with severe LN, increased serum creatinine, decreased hematocrit, and race (Caucasian, Hispanic, or Asian ethnicity) represented the strongest clinical predictive model of poor outcome. Adding severe active and chronic irreversible renal parenchymal injury identified particularly high-risk patients (4). More recently, the long-term course of 213 patients with LN during a mean follow-up of 37 months was assessed. Patients reaching the composite outcome of doubling serum creatinine, ESRD, or death had predominantly proliferative LN with higher activity, and higher chronicity index scores. In addition, patients reaching the composite outcome had higher baseline mean arterial pressure and serum creatinine or proteinuria, but lower baseline hematocrit and C3 compared with controls (19). Taken together, these data support that histologic lesions, particularly proliferative and/or chronic, predict poor prognosis. The significance of severe segmental lesions in LN and its prognostic value is still a matter of debate. Previous studies by the Collaborative Study Group have suggested that a subgroup of LN with severe segmental lesions involving most glomeruli (severe class III, as defined by some, based on the somewhat ambiguously worded previous WHO definition) may have a different pathogenesis than the global proliferative lesions of class IV LN. These severe segmental lesions often had necrosis and crescents, similar to pauci-immune necrotizing and crescentic GN (9,20–24). Indeed, the designation of class IV-S versus IV-G in the ISN/RPS classification was an attempt to further study these important observations previously evaluated by the Collaborative Study Group clinical trial. Their patients with active and/or necrotizing lesions in ≥50% of glomeruli had higher risk for progression to ESRD compared with patients with diffuse proliferative LN (9). Several subsequent retrospective studies utilizing the 2003 ISN/RPS classification concluded that the outcomes of classes IV-S and IV-G were similar (22,23). However, among those with persistent lesions at a second renal biopsy after induction therapy, there was better renal 10-year survival with IV-S lesions (63.6%) versus those with IV-G lesions (0%) (23). Furthermore, the IV-S biopsies had fewer immune deposits with more fibrinoid necrosis compared with IV-G. Other studies have also reported no significant difference in the outcome of IV-S and IV-G LN classes (11,24,25). In a study of 92 patients with LN who were reclassified according to the ISN/RPS 2003 criteria, renal function was more likely to deteriorate in IV-G than in IV-S patients. Importantly, when class IV-G was subdivided into cases involving active lesions alone (IV-G [A]) or with additional chronic lesions (IV-G [A/C]), most IV-G (A) patients were nephrotic, but responded well to therapy. In contrast, patients with both active and chronic lesions (IV-G [A/C]) had persistent proteinuria in spite of intensified therapy and showed decline of renal function (26). In a recent meta-analysis, comparison of eight studies revealed no difference in ESRD between class IV-S and IV-G LN (27). A more recent study from the Collaborative Study Group (28) highlights that the distinction of class IV-S versus IV-G by the ISN/RPS classification does not exactly capture the “severe WHO class III” cases originally reported, because application of the ISN/RPS criteria to those original study cases resulted in the inclusion of some WHO “severe segmental GN” class cases (WHO III ≥50%) into the diffuse global GN class of the ISN/RPS (IV-G). This is due to the definition of “segmental” as <50% of the tuft in the ISN/RPS classification, whereas in the definition used by Najafi et al., “segmental” was taken to include any glomerulus with even one loop spared. With this perspective, 22 biopsies with ISN/RPS class IV-S and 61 with ISN/RPS class IV-G were reviewed, and cases of “severe segmental” lesions (IV-Q) and 39 with diffuse global lesions (WHO-IV) were assessed. Remission rates were worse, with fewer patients with stable renal function and worse renal and overall survival in class IV-Q compared with WHO-IV or IV-S patients. When IV-Q and WHO class IV were combined to form one class (IV-G) as indicated by the definitions and criteria of the ISN/RPS classification, and compared with the outcomes of the ISN/RPS IV-S class, the renal and patient survival curves were not different (28). Whether these patients have ANCA or ANCA-like pathogenic mechanisms has not been shown. Approximately 20% of patients with SLE have ANCA positivity (29). Some patients with apparent necrotizing and crescentic LN have absent or rare subendothelial deposits without significant endocapillary proliferation and have positive ANCA. These cases likely represent coexistence of LN and ANCA-associated necrotizing and crescentic GN (30). Selected ethnic populations, such as African Americans and Hispanics, have higher frequency of developing LN and have been reported to have poorer outcomes than Caucasians despite treatment (31–33). As a result, the prognostic value of the distinction between segmental and global lesions in proliferative LN varied according to the classification and the population selected for study. In the Collaborative Study Group clinical trial, biopsies with segmental active lesions defined according to the WHO classification were significantly more common in African Americans (76%) versus Caucasians (44%), and diffuse global lesions were less common in African Americans (24%) versus Caucasians (54%) (31). The definition of active and inactive lesions was first introduced by the pioneering work of Pollack et al. in 1964 (34) and this definition was later developed further into an Activity Index and Chronicity Index by Morel-Marogel et al. (35) in 1976, which were further developed in a semiquantitative biopsy scoring system by Austin et al. at the National Institutes of Health (NIH) (36). With this model, in a cohort of diffuse proliferative or membranoproliferative GN lesions, a high activity index with lesions, such as cellular crescents and fibrinoid necrosis, predicted unfavorable prognosis. Even more striking was the predictive value of a high chronicity index (37). The predictive value and reproducibility of these indices, however, has not been substantiated by subsequent studies (38–41). Thus, mean activity index was not different in patients with diffuse proliferative disease in those with or without adverse outcome, and chronicity index did not predict outcome (41). More recently, when a semiquantitative index of immunofluorescence staining for glomerular capillary, mesangial, tubulointerstitial, and vascular compartment was added to the histologic parameters of activity and chronicity, higher correlation with clinical outcome than the NIH indices was found (42). Despite these unresolved controversies, active lesions (i.e., endocapillary proliferation, necrosis, and cellular crescents) versus chronic lesions (i.e., sclerosis, fibrous crescents, and interstitial fibrosis), in addition to class of LN, influence response to therapy. Therefore, the ISN/RPS classification recommends that these parameters be detailed. However, additional studies of well defined pathologic variables with improved reproducibility will be helpful in further assessing independent prognostic renal biopsy factors in LN, as has recently been applied to IgA nephropathy (43). Few repeat renal biopsy studies have been performed in LN patients. The predictive power of a repeat renal biopsy for the end point of serum creatinine doubling, but not of the corresponding baseline biopsy, was reported in a study assessing glomerular activity, tubulointerstitial activity, chronic lesions, and immunofluorescence indices (44). However, repeat biopsy findings were not predictive of outcome in one trial of LN (45). Clinically relevant class switches have been observed more frequently in patients with nonproliferative lesions in a first biopsy, whereas as expected, patients who initially had proliferative lesions rarely switched to a pure nonproliferative nephritis when biopsies were done during a flare (46). No correlation between NIH activity index >4 or <4 at repeat biopsy and long-term renal outcome was found in a small group of patients in the MAINTAIN trial (47). However, histologic parameters of renal disease and the activity index, but not the chronicity index, on repeat biopsy after treatment reliably predicted renal outcome by logistic regression in a recent study (48). As recently demonstrated in IgA nephropathy (43), interstitial fibrosis may predict renal function decline in some patients with renal disease. Severity of tubulointerstitial lesions correlates with glomerular proliferative lesions in LN (49–55). In one study, interstitial lesions were significantly more severe in class IV LN, compared with moderate in class III, and mild in class II and V. Overall, severity of tubulointerstitial lesions in classes IV-S and III was similar, but the interstitial inflammatory cell infiltration was higher in IV-G than IV-S, perhaps reflecting differences in disease pathogenesis. Interstitial infiltration, tubular atrophy, and interstitial fibrosis were significant independent risk factors for renal outcome. Furthermore, the glomerular disease activity correlated with more interstitial inflammatory cell infiltration, and chronic glomerular lesions correlated with tubular atrophy and interstitial fibrosis (56). These findings imply that the interstitial lesions could be the consequence of glomerular injury. Different types of vascular lesions may be seen in LN. Lesions include uncomplicated vascular deposits (medial immune complex deposits in arterioles and small arteries), thrombotic microangiopathy, lupus vasculopathy (noninflammatory necrotizing lesions with variable immune deposits), and the more uncommon lupus vasculitis (necrotizing and inflammatory vasculitis with transmural infiltration of the vessel wall). The presence of uncomplicated vascular deposits does not significantly affect prognosis (57). Renal vascular lesions other than uncomplicated vascular deposits in lupus patients correlated with higher serum creatinine at the time of renal biopsy, hypertension, and lower kidney survival in one study, with worse renal survival at 5 and 10 years (74% and 58% versus 90% and 86%, respectively) for those with renal vascular lesions (58). Thrombotic microangiopathy (TMA) may occur with glomerular proliferative lesions or in isolation. From 1% to 4% of patients with SLE have an episode of hemolytic-uremic syndrome/thrombotic thrombocytopenic purpura with a prevalence of 28% in an autopsy study (59). Although some of these patients have positive antiphospholipid antibody, these antibodies are only found in up to 50% of all patients with SLE (60). In one study, serum ADAMTS-13 activity was significantly lower in patients with both LN and TMA than in patients with LN only or in normal control (40% versus 69%; 40% versus 81%). The prevalence of ADAMTS-13 autoantibodies was significantly higher in patients with both LN and TMA than in patients with LN only or in normal control (86% versus 18%; 86% versus 0) (57). In this study, patients with LN class IV-G and TMA lesions in the renal biopsy had higher prevalence of ARF and worse renal outcome compared with patients with only LN class IV-G lesions (61). Several studies have focused on the discrepancy between clinical presentation and pathologic findings at renal biopsy in patients with SLE. Silent LN has been reported not only in class II but also in class IV (62–68). Even patients with low-level proteinuria (<1 g/24 h) have demonstrated significant renal involvement with proliferative LN (classes III or IV) (69,70). More recently, LN other than class I was found in 58% of biopsied patients without clinical renal involvement. Of note, class III or IV LN was found in 15% of these patients (71). Nephrotic syndrome, which is commonly associated with diffuse (class IV) or membranous (class V) LN, has also been described in patients with minimal mesangial (class I) or mesangial (class II) LN (72–76). The extensive degree of foot process effacement and proteinuria in these patients with only scattered subepithelial and mesangial deposits support the possibility that podocyte foot process effacement in lupus may be caused by mechanisms other than immune complex injury, such as cytokine-related injury. Whereas steroids are the mainstay of treatment for minimal change disease, minimal or no immunosuppressive therapy is indicated in patients with only LN class II. Therefore, recognition of this entity in these patients is important. In one study of 11 nephrotic patients with SLE, renal biopsy showed no deposits in 8 and only mesangial deposits in the remaining 3 with extensive foot process effacement. Thus, diagnosis of minimal change disease or FSGS was made and these patients achieved remission after steroid therapy (74). In another small series of SLE patients with class II mesangial LN and nephrotic syndrome, all had extensive foot process effacement, consistent with additional minimal change disease, and responded rapidly to steroid therapy. Other rare nephrotic patients with SLE and mesangial LN have also shown response to cyclosporine or prednisone (72). These studies indicate that recognition of podocytopathy in nephrotic patients with mild immune complex LN is important to provide adequate management targeted to the renal lesion. An additional role of the renal biopsy is in recognition of any other cause of renal dysfunction not related to LN. Non-LN has been documented by several studies of renal disease in SLE patients, reporting cases of FSGS, IgM nephropathy, amyloidosis, arterionephrosclerosis, thin basement membrane lesion, and acute interstitial nephritis (77). For example, we have observed aminoglycoside toxicity causing acute tubular injury superimposed on mesangial LN in an SLE patient with acute increase in serum creatinine. Once diagnosis is established, the renal biopsy has a very important role in assessing the response to treatment or the need for further immune suppression, directing aggressive treatment in the presence of active lesions, and avoiding overtreatment of predominantly chronic lesions (Table 2). Furthermore, transition from one type of lesion to another, as shown by repeat biopsy, may lead to more specific and targeted therapy (Table 3) (78). Early clinical and histologic diagnosis of LN is pivotal in order to minimize the risk of progression to ESRD (79–81). In this setting, a renal biopsy is generally indicated in any case with acute increase in serum creatinine, proteinuria >500 mg/24 h or urine protein/creatinine ratio >0.5 g protein/g creatinine, hematuria in presence of any level of proteinuria, and active sediment/cellular casts (5). Some patients with lesser amount of proteinuria may also manifest active disease, and biopsy should be considered in the presence of new proteinuria or hematuria (69). A repeat renal biopsy should be considered in cases with persistent or worsening proteinuria, increasing serum creatinine during treatment, or development of an active sediment in patients with a previous nonproliferative lupus class. In this setting, repeat renal biopsy is particularly helpful in promptly instituting more vigorous treatment, when indicated (81). In patients with known class III or IV, a newly active sediment usually indicates a flare of proliferative LN, and a repeat biopsy may not be needed (44). The renal biopsy represents the gold standard in management of LN. Studies performed so far show an overall greater reproducibility of the ISN/RPS classification than previous classifications. However, precise assessment and identification of key tubulointerstitial and vascular lesions with prognostic importance are lacking. The varying patterns of glomerular injury, whether segmental, dominantly necrotizing, or global proliferative, and type of sclerosis also remain incompletely understood in terms of pathogenesis and prognostic effect. Thus, additional studies are needed to evaluate the prognostic relevance of the 2003 ISN/RPS classification and add new prognostic biopsy parameters. You are going to email the following Lupus Nephritis: Is the Kidney Biopsy Currently Necessary in the Management of Lupus Nephritis?